You may have noticed a distinct lack of outfit posts as of late, and maybe you’ve wondered if I’d grown a third eyeball or something. Well, not quite . . .
See, firstly it was summer. Summer, with heat in the hundreds, means a whole lot of cut-offs and tank-tops and flip-flops (what is it with hyphenated hot weather clothing?). Those sorts of ‘outfits’ don’t leave much room for creativity, ya know? Crazy, right? HA! Five months today, in fact. Damian and I are so excited!!! I want to apologize for keeping this a secret for so long. There were a few good reasons though. I wanted to be cautious with putting my private life in such a public space. I wanted to be sure everything was safe and steady, before I came out with the big news. Also, it’s important to me that you guys, my readers and community, know that I am capable of keeping this very exciting part of my life separate from my ‘professional’ life here on Bonzai Aphrodite. I wanted to show you that this site isn’t going to change, isn’t going to become all family-centric baby-blog.I am determined that BA stay just the same, okay? But for just today . . .
YAY YAY YAY! I’m going to have a SON!!! This is seriously the most fun I’ve ever had. EVER. For those of you who *are* interested in following the journey of our little lentil, I’ll probably include baby related updates in the Friday Feedback Forum. But who knows, maybe y’all will be interested and ask for more information and articles. I’ll just have to play it by ear, ’cause, you know, I’ve never done this before. HA! Love you guys! Thanks so much for always being mind-blowingly awesome!!! Oooooh…. Am I really the first who gets to say CONGRATULATIONS?! Yay! 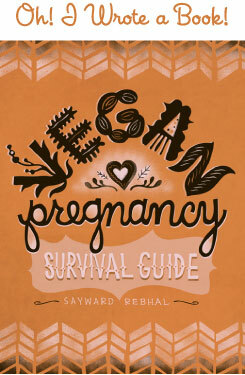 I’m so excited about the new vegan baby, I wish you guys a lot of good energy and good health! I’ve only ever heard about one vegan baby so far, and she was in perfect health. I bet the doctors went all “blah-blah-blah, drink milk and eat meat!” about the pregnancy? Have you had to deal with a lot of crazy doctors? I am very excited for you and you really seem like you will be a fantastic mom! Congratulations! I, for one, am looking forward to baby updates. CONGRATULATIONS!!! LOTS of baby bump pictures please! I live vicariously through everyone else’s pregnancies and babies until I get to have my own. And I nanny, so healthy green baby tips are always good to hear. Congrats! Funnily enough, going dairy-free was a direct result of child #2 for me. Not by choice (I loved cheese, what can I say) but because she was clearly not tolerating it well in my milk! For that, I had to do my own science, because her doctor, well-meaning though he was, just didn’t know enough about breastfeeding to recognize the symptoms. Gongrats!! It is so great to welcome a new vegan baby in this world! I hope everything goes well and you guys are happy! I love your site! I look forward to following this new ‘project’, as do most people in here, I think! Your site is spot-on and a great inspiration for ways to improve the way I live my life, and in my opinion posts and pics about baby/child related topics wont be too far off what your site is all about – I mean, we all *started* as babies, and even if I don’t have kids myself I have nieces/nephews/friends’ kids etc. Congratulations! You are waaay ahead of where I was when I first got pregnant. Having children is what ended up prompting me little by little to look into a safer, healthier lifestyle. You’re sooooo ahead of the game! Yay! Finally! Man, it was getting hard for me to remember not to mention anything about it on here! I think that you could include tips when they are directly relevant to your mission and philosophy here. For example, I would love to see vegan baby food recipes when you’re at that point and if you were making your own baby hygiene products that would be something I would like to see here as well. I think those things could certainly be included without changing the fundamental nature of your blog. Congratulations Congratulations!! I think baby-savvy posts once a week are not at all overbearing. Also, if you’re looking for mom tips, I like ‘Ideal Bite’ – they have a separate site for moms and new babies for eco-chic products. You’ve probably found them, but if not I hope you like the site. Congratulations again!! Holy congratulations! This is so great, I’m sure so many readers will learn so much from this! But I have one non-baby related burning question: is that really your natural hair colour!? Congrats you gorgeous green goddess!! I think your tiny one is growing up a in great environment! Have you been reading up on all the amazing green toys and clothes that are available now? :) I may not ever have children but I am excited for you! Please feel free to share your “growing pains” with your readers because we are all curious! And OF COURSE I want to hear all about the journey! Little updates here and there aren’t gonna cut it. Pft. Lol. I kid, I kid. Seriously though…BEST JOURNEY EVER!!!! You might want to make a whole other blog just for it too! HAHA. I so can’t wait for pics now. LOL. I have never wanted children but, like Jackie, I enjoy living vicariously through others and I will be intrigued by your alternative methods of child-rearing, especially when confronted by so much dissent towards vegan children. Good luck with all of that! Just read about something that I thought was cool. The WIC (Women, Infants & Children) Program is a federally-funded, state-run program which provides vouchers for low income pregnant & breastfeeding women and their children up to age 5 to redeem for food at local grocery stores. (I have no shame in admitting that I participated in the program before my financial situation stabilized) Anyway, this month, for the first time in the program’s history, they announced that there will now be a vegan option in which families can choose soy milk & tofu instead of cow’s milk & cheese, soy formula for infants & fruit and can get extra fruits and veggies if they choose not to redeem the vouchers for jarred baby meats. YAY!!!! All families deserve to be able to make ethical choices, regardless of financial situation! So please at this new development! wow, that reads like an ESL essay. should have proofread before i submitted. i think you get the point, though. Congratulations. I cannot think of any news more wonderful than this. Perfect. I would like to say that you are only beginning to experience the changes coming. This cannot help but spill over into this site, nor should that be anything to resist. In life things either change or they die. If they are expansive enough, robust enough and flexible enough (sounds like I am talking about your belly) then that change shows up as development and evolution. The goddess of love may have to become the goddess of home, hearth or family but this site would not be what it is without Sayward being full out Sayward. That’s the real reason we keep coming back. Who you will be a year or even six months from now we can only guess but it sure as hell won’t be the same person. So don’t hold back! Also, as a father, include Damian too (love his photo “Wife” by the way). We guys do play an important part from time to time and have some interesting points of view. Since no-one else brought it up, I was wondering if you were at all considering home-birth? Having had three at home I highly recommend it. Anyway I also would like to say that this use of the word “bump” seems somehow lame to me. Those two bumps above have already had enough semantic abuse, can’t we leave the womb alone? I mean its not an accessory or fashion statement, its a human coming into being inside a woman and all the natural sensual richness of the senses that implies. OK, no big deal, just my two cents worth. Yay!!! Congratulations!! I can just see you being one of those women who look absolutely fantastic through their entire pregnancy. So looking forward to as much as you want to share here!! I haven’t had a baby yet, but my friends with kids have totally convinced me on home birth….if you work with a great mid wife I would highly suggest it and I plan to do it myself when my time comes! And am I totally not adverse to baby-related posts. Raising children ethically is just as important as grown people living ethically. Congrats!! I love reading your blog, and though I don’t have any kids yet, I’m super excited about any pregnancy/baby related stuff you end up posting! Cause I plan on being there one day! Again, congrats!!! Ooo, ooo, ooo…I just noticed the blue background in your pics….newly painted walls eh??? Baby boys room? Am I right? Am I right?!? Hee hee…. I’m with Julie: baby-related posts are very welcome as part of your overall mission. Not every tip or observation is useful to every one of us anyway, and part of the appeal of the site is the integration of aspects of life that we don’t usually see presented together. Again; Congrats! This kid’s going to have an awesome life to look forward to! Congratulations! Let me know if you need any tips on cloth diapers. We’ve had our twins in cloth diapers since they came home from the hospital, which means that I now officially know Way Too Much About Poop. I have done everything as cheaply as is humanly possible, which has meant a lot of secondhand, creative scrounging and crafting. I’ve been reading for awhile after I found your recipe for haggis (which I made, which was lovely and took me back to Scotland…) ANYWAYS, congratulations! Wow, you guys! I am overwhelmed! You all are so kind and supportive and wonderful! Thank you so much for the love and well-wishes. You’re makin’ me all ferklempt! THANK YOU!!! @ Ginger – Thanks for the offer, I may take you up on that! Right now I’m sort of simultaneously feeling very clear on what I want, and very overwhelmed with all the info. Ha! @ Sandra – Woo-hoo Estonia! Helloooo! @ Julie – Man, how do you think I felt??! This was a hard one to keep secret! And wow, that is WONDERFUL news about WIC. They are a fantastic organization, one that I may end up participating in myself (we’ll have to see how it all goes), and it’s so good to know that families like mine will have the support and options that they need. Yay! This is awesome! @ Kate – I’ll check out Ideal Bite, thanks for the tip! @ Sara – Haha, NOPE. It’s got a red tint over it – although you can see the roots growing in and it sort of makes me look balding. Eesh, I need to re-dye. All the hairdye posts last month were a direct result of this baby, and me rethinking my dyeing habits. Both the OB and Midwife assured me that minimal, non-toxic hair dye was perfectly safe, and I did dye my hair a few times in early pregnancy. But after doing my own research I just wasn’t comfortable. So this is the Manic Panic over unbleached hair, and soon I’ll be trying pure Henna. @ Tenise Rae – Aww, congrats on your baby girl! And yes . . . another blog . . . stay tuned! And about the walls (good eyes! ), not a baby room, but a brand new living room makeover! Very exciting for us! Hmm, ‘bump’ doesn’t bother me, I think it’s cute and sort of natural to ‘nickname’ these sorts of things. But I definitely see your point. I’ll think about it . . .
@ Courtney – Oh gawd no pressure! Haha, just kidding. Thanks lady! Here’s to hoping! Having an interest in a healthy, sustainable, environmentally conscience lifestyle was already my bag but once I got prego with baby boy number one (22 months) I kicked it into gear. Raising another human really puts things into perspective. Stumbling on your blog has given me many a inspiration especially when baby boy number 2 came along (6 months). So I should tell you, ever since I found you I was thinking, this blog needs a baby. And, here we are. I look forward to hearing and reading all about it. I agree with a lot of the comments, especially about it being a shame more good, smart people seem to be choosing not to have kids nowadays. I used to not want any, but now that I met someone who actually shares my values, I can’t wait to have a big family! I’ll be living vicariously through you as well, until I start that fam of my own! Hey Say, I was looking through some old blog posts and found this photo of me that was taken when I was 5 months to the day pregnant. I realized that’s exactly how far you are in this picture, too. I was huuuuuuuge already. Yours is so cute & little. I think it’s partly cause you’re so tall so you carry a lot differently. Anyway, just thought I would share. Conratulations! I’m so happy for you that all I can think to say is Congratulations!!! I’m late to the party, but must also say congratulations!!! Separating one’s personal life and, uh, blogging life? can be a difficult thing to define/decide, but I admire your decision to share this. Congratulations! Most amazing DIY project yet! Just stopped in from several months of being away from your site. (I was moving from Denver to Manzanita, OR). SOOOO happy to hear your news! Blessings to all of you!